Credit unions typically have a limited number of branches in a local area. If you are away from your credit union’s service area, some credit unions participate in a service that gives you access to banking services at other participating credit unions near you. It’s called shared branching. The branch you visit, although belonging to a different credit union, acts like a branch of your own credit union. All participating credit unions bonded together give local credit unions a national footprint of branches. I know about this service but I have never used it until now, because Alliant Credit Union, where I have my primary checking account, does not advertise shared branching service. Among 3,500 credit unions in the CO-OP network, only 1,800 participate in shared branching. So many don’t participate because every time a member visits a shared branch, the home credit union has to pay a fee to the network and to the credit union that performs the service. Source: CO-OP Financial Services, retrieved on October 6, 2015. Alliant Credit Union also makes it unnecessary to use shared branching to begin with. Although it’s in Chicago and I’m in California, I never had the need to go into a branch, shared or otherwise. I’m able to do everything online or through ATMs, including free bill payment, next-day ACH transfers both ways, reimbursement of ATM fees, and depositing cash and check to ATMs operated by another bank or credit union. This changed when I opened a CD with Northwest Federal Credit Union recently. Although the maximum for the CD was $100k, the online application limited funding to $15k maximum. I had to figure out how to deposit an additional amount to the CD. Only later I learned if you wanted a higher funding amount you could include such request in the note section. Nowhere in the online application said that. After I linked my Alliant checking account as an external account in online banking at Northwest, it worked only as a destination, not as a source, for transfers. Usually banks want you to transfer money into them. Here Northwest only allowed pushing out money, not pulling in money. Later I learned pulling in money will be enabled only after one becomes a member for six months and it’s maximum $2,500 per day. It seems to me the ideal time to convince someone to move money to you is when they are new. I thought about linking the other way and pushing the money from Alliant to Northwest, but it wasn’t obvious what was the account number to use for this purpose. Northwest’s online banking doesn’t show the full account number. They really don’t want to make it easy for you to send them money. So I figured I’d try shared branching to make the deposit. Finding a shared branch near me was easy. I told the teller there that I wanted to make a deposit to a CD at a different credit union. She asked me for the name of the credit union and my member number. She was able to pull up my account with just those two pieces of information. However, she said depositing to the CD wasn’t an option, even though the CD was an add-on CD, which allowed additional deposits. My only option was to deposit to the member savings account. Oh well, what can you do? Depositing to the savings account at least would get the money closer to its intended destination. I wrote a check to myself. She asked for my ID. After I signed on an LCD screen, she gave me a deposit receipt. That was easy. Back to my computer, I was able to see the deposit online right away. Great, but the money was still a small step away from where I wanted it to be. I tried moving the money from the member savings account to the CD in online banking. I couldn’t. The CD wasn’t an option in the transfer dropdown. I sent a secure message through online banking to customer service. They moved the money to the CD for me. Whew! Later I learned although you can’t move money from savings to CD in online banking you can do it if you download the credit union’s mobile app. So many secrets! Although shared branching was easy enough, I wish I didn’t have to use it to begin with for simply making a deposit. After visiting a shared branch and causing the credit union to pay a fee, I still had to contact customer service and ask them to do the last leg. I’m glad that I only had to do this dance once in three years. I much prefer Alliant Credit Union’s setup, which lets me do everything easily myself. Anybody can join Alliant Credit Union with a one-time $10 donation to a supported charity. Good summary of using shared branches in credit unions. However by now you probably heard of another option to initially fund this Northwest CD. On the online application, yes the maximum funding amount was 15K. But if you called or messaged Northwest they would override the initial funding to whatever you wanted. I transfered the whole 100k initially from Ally easily. Northwest should have been clearer that changing the initial amount was easily done with a phone call to them. That’s the point. They keep so many secrets from the customer. If they are able to override the limit for everyone, why have the low limit to begin with? Just bump up the limit in the online application and you don’t have to whip customers through hoops. That was entirely too much hassle. The interest may be a bit lower, but I’ll stick with Ally Bank. Lack of frustration — priceless! Before paying $10 to join Alliant, check the list of organizations. For example if you belong to your local PTA you can join for free. Thank you for your suggestion. I initially transferred the 15K, then connected the account to my online savings account. Pushed through the additional amount to the NWFCU savings account. Then called NWFCU and had them transfer it into the CD… It wasn’t difficult. I like knowing that I can do that myself through the mobile app though. I will try that next time. Oh no! I opened the NWFCU 3% Add-On CD recently, too, and was planning to add more money by selling a short-term muni bond fund that’s only yielding about 1%. I thought I could easily transfer the money from brokerage firm, or pull it in from NWFCU. Sounds like it can be much more complicated than that. (And I believe there’s a limit to how long you can add new money to the NWFCU CD, so I guess I better get going on this). Thanks for the helpful post & comments. Lynne – If you want to transfer the money in from your brokerage firm, contact NWFCU to get the full account number for ACH. I read it’s 1 plus a few 0’s plus your member number. There is no time limit for adding money to the CD. You can do it anytime before the CD matures. Of course you won’t start earning 3% on the new money until you add it. Can you let us know what percentage of credit unions who participate in the CO-OP ATM network also participate in shared branching? If that percentage isn’t close to 100%, and as you say cost really isn’t an issue, what are the real reasons they choose not to be part of it? These credit unions are OK with having their customers interact with a machine at a different credit union but they just don’t want their customers to go inside. Why? Shared branching is just one of many access services offered by credit unions, though it is a wonderful example of how these not-for-profit institutions cooperate with each other. The cost savings to a credit union is substantial, especially when you consider that it enables a credit union to have an expanded physical presence without having to build branches of their own. It is a part of the omnichannel user experience that includes online, mobile and in-branch services, which all financial institutions must offer to today’s consumer. In fact, shared branching is a crucial element in the advance of member self-service, allowing institutions to focus greater attention on more complex banking needs of members. So, self-service (ATMs, etc.) versus branch is a false comparison – you need both, though of course the individual credit union must determine the best mix for their members. With all due respect, this is ridiculous. You came here to say I got something wrong. When I gave you an opportunity to set the record straight, you just wasted it. I don’t run a credit union. You don’t have to launch the value prop sales pitch at me. 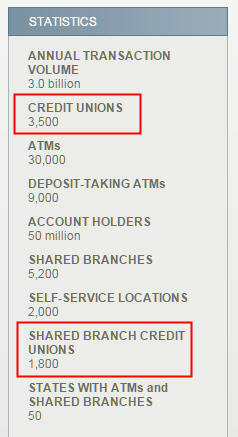 Save it for the credit union executives who make the decision on whether to sign up for shared branching. When you avoid answering direct questions, you leave it to the worst imagination. The adoption rate of shared branching must be really low, low enough that you are embarrassed to say it. The main reason for not adopting it must really be the cost. Otherwise you would’ve given the real reasons. That’s not a good way to do PR. Just answer the questions with facts. Let the facts speak for themselves. Allow me to ask the questions again. 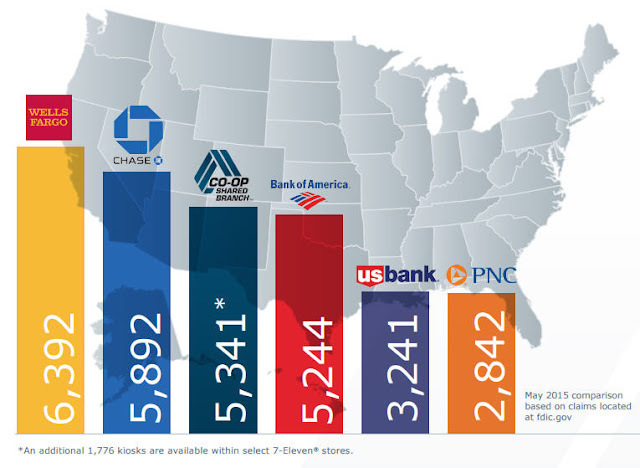 What percentage of credit unions who participate in the CO-OP ATM network also participate in shared branching? Why do some credit unions not sign up for shared branching when it’s something that “all financial institutions must offer to today’s consumer”? They apparently determined it’s not a must after all or are you saying they are serving yesterday’s customers? Please don’t blow this second chance. I read this person’s reply and thought he must think that I am stupid and that your readers cannot see when someone is blowing smoke. Thanks for setting the record straight. What happened to the other 1,500 credit unions they had as of 2015? Did they lose them or do they have a tighter definition now for “in ATM network”?